“School dismissed 2.55pm. Doctor Grace, his son, Lockwood and several other professional cricketers are playing a 2 day match at the Park and I want the elder boys to see the game” wrote the headmaster, Charles E Thomas in the school log book of Toddington Church of England School for 14 and 15 September 1899. 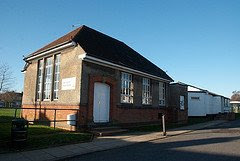 Other events such as football matches with local schools, Sunday School teas held by the different denominations in the parish, jumble sales, school concerts, and polling days led to the closure of the school, either for all or part of a day. These were rare highlights in school life. Other closures occurred because of less happy events such as an epidemic of measles in 1906. Superficially the log books can seem repetitive and, even, boring, recording the weekly round of the school. They note average attendance each week and the effect of the weather and sickness amongst the children on attendance. Whooping cough, scarlatina, influenza, ringworm and measles, which seems to have caused most alarm, were annual occurrences. Absences also happened when the older children were needed to take dinner to the haymakers or to help at harvest time with blackberrying, etc. The log book concentrates, of course, on teaching, with a lot of references to the themes of Object Lessons that were taught to different classes (‘standards’ to use the contemporary nomenclature), including dog, sheep, lion, tiger, ostrich, railway station, blacksmith’s shop, iron, coal, and thus introducing children to everyday things and to things that would be well beyond their experience. Much less is said about other subjects although it is clear that reading, writing, arithmetic, drawing, geography, history, religious instruction, singing, recitation and domestic economy (for the girls) were taught. There were drills and route marches. Gardens were established so that the boys could be taught gardening. The school board manager, the local vicar and curate, local gentry and HM Inspectors visited regularly. Log books rarely mention pupils by name except for real successes or tragedies, such as the death of “a little scholar”, Oliver Clarke from Standard II. “He was only absent from school a week. The cause of death was acute blood poisoning.” An unusual listing of names occurs in January 1899 when those children who had reached the required level were allowed to leave below the normal leaving age in order to go to work: Charles Hobbs, Fred Buckingham, Alice Reid, Ernest Brazier, Ida Coles, Rose Evans, John Nash, George Ansell and Charles Kingham. The teachers figure prominently in the log. Most were pupil teachers and their work and exam successes are often mentioned. From their names – Briden and Muckleston in particular – they were locals who were working hard to make a career for themselves. The annual school report was usually good, except in 1906 when discipline had been a problem, and can best be summed up by the 1904 HMI report that “Mr Thomas deserves the highest credit for the manner in which he conducts this difficult over-crowded and under-staffed school.” The annual budget was inadequate for improvements to the premises such as new desks and more toilets for the Infants, or Babies as they were called sometimes and babies they were too, some starting school as young as three. Some of the improvements, such as a wall round the girls playground, and luxuries such as prizes were paid for through concerts and jumble sales run by the school itself. There is so much more in the log book – violin lessons for 15 pupils given by a local violinist; girls going into service; the headmaster also being the local church organist; the jubilation at the telegram announcing the Relief of Ladysmith; the children marching on to the Green with the Union Jack and singing patriotic songs - that anyone interested in Toddington and in turn-of-the-century school life should read it at BLARS. Photo (copyright of Ewart Tearle) of the Old School Toddington. Is this the school which is the subject of these logbooks?